The Pioneer to Baan Wang moved here from Lan Chang District of Laos after discovering the fertility of the soil in the area and decided to settle down and named the new community after an abundant swamp plant, “Nong Wang.” Later, a group of local folks separated themselves from Baan Lao Kan Tao, Payakkhapumpisai District, Mahasarakham joined in building houses that became Baan Wang today. 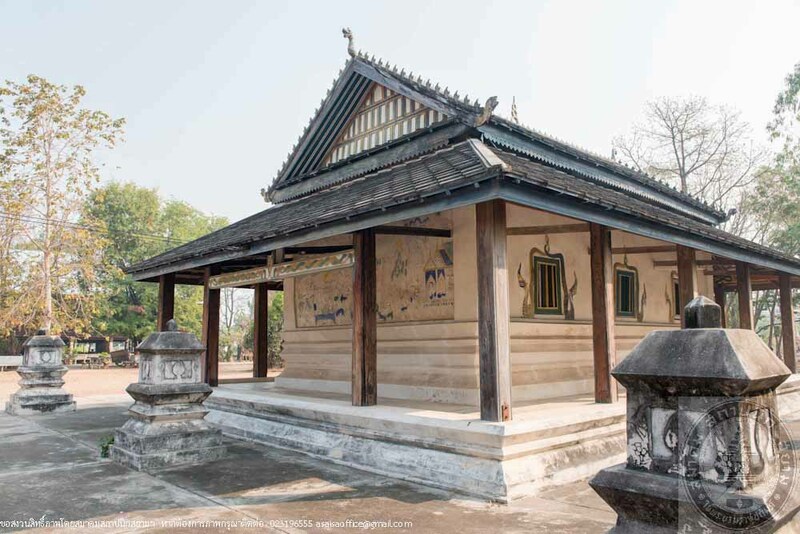 Wat Borommakhongkha, founded in 1811, was the center of the community and has its own Ordination Hall or Sim. 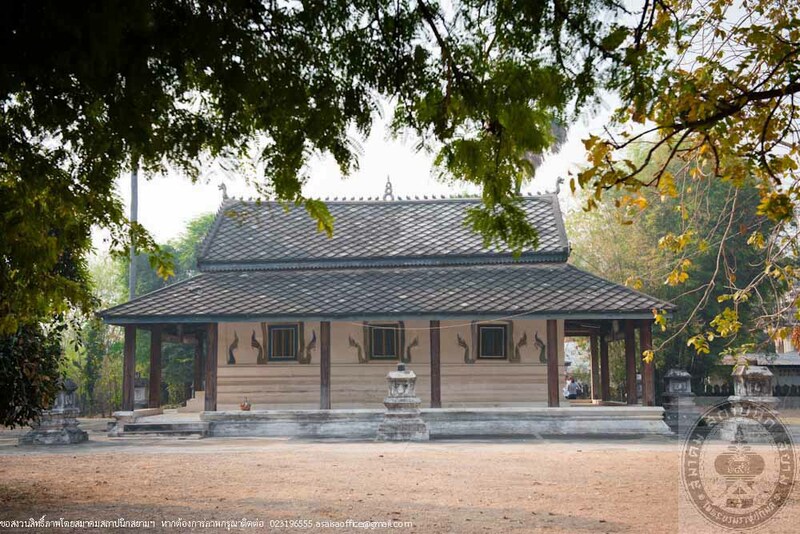 The temple was granted the land for establishing a central hall by the King on March 12, 1909. The sim has been used in Buddhist ceremonies and has undergone several repairs. Wordings engraved on the sim’s door stated, “Built in 1924 and completed in 1926. Pra Bao led the disciples and the laypeople to maintaining it.” Since the beginning, the sim was known for its stunning design and therefore the community people were also referred to as “People of Baan Wang, home of the beautiful chapel.” On December 18, 1996, the Fine Arts Department registered this sim as historical monument. The sim then began to deteriorate over time with wooden lath structure damaged by termites. The laypeople proposed a restoration plan to The Fine Arts Department to request for a funding but were denied. The people then hosted a robe offering ceremonies and were able to allocate sufficient funds to restore the sim and the restoration was completed on February 2, 1999. 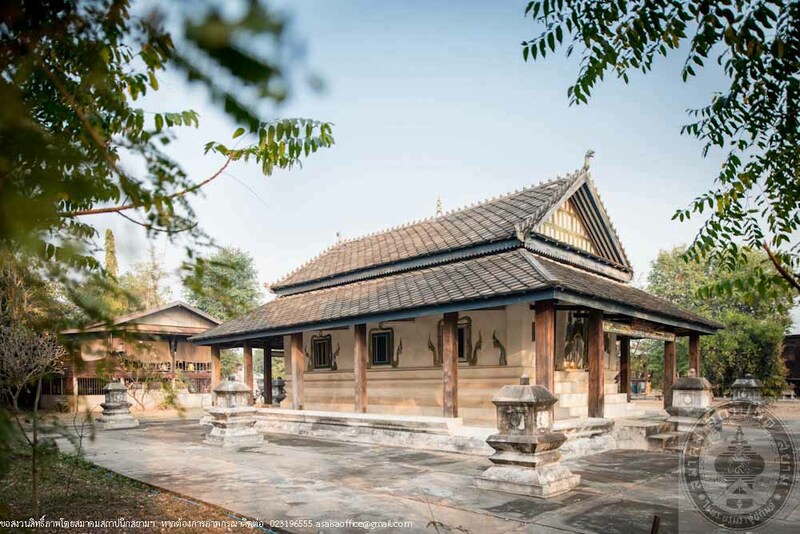 From 2014 to 2015, Architectural Technologies students from the Industrial Technologies Department of Buriram Rajabhat University studied the history of the hall, conducted a survey and created the architectural drawing of the building in an effort to preserve the community’s cultural heritage. 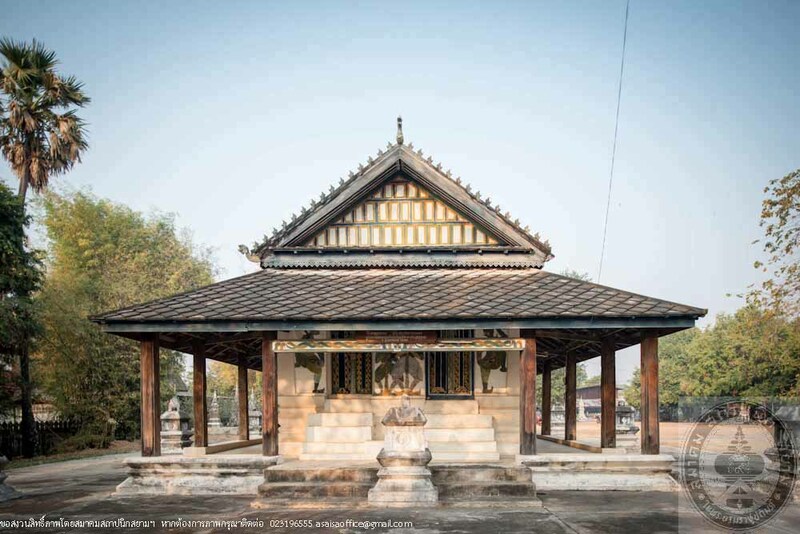 Wat Borommakhongkha’s sim is an opaque building of 10.19 meters wide and 14.48 meter long surrounded by a terrace situated on pratakshina yard. The terrace was raised 0.60 meter above ground with three-step stairs at the front entrance. The sim’s interior space is rectangular, 5.59 meter wide and 9.39 meter long and was raised approximately 1.20 meter above the terrace level. There were also a high tiered base with two sets of five-step stairs, sixteen pillars made of Erythrophleum wood 30 centimeter thick on the terrace, the building walls built of raw clay brick plastered with cement of 50 centimeter thick with a mural paintings of four mythical giants on the front wall of the sim. 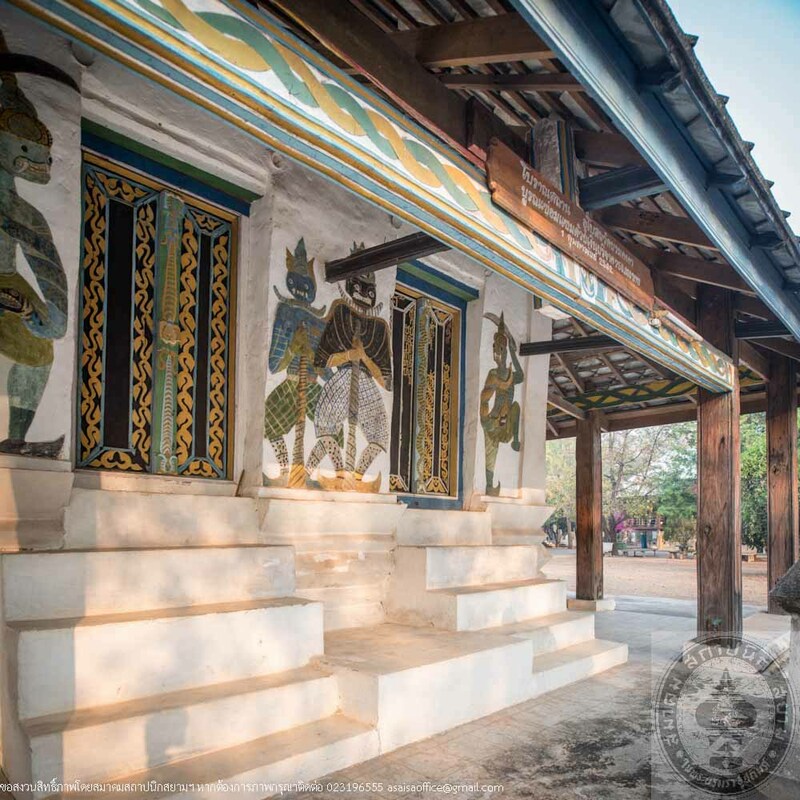 The arch window is beautifully decorated with a pair of Nagas which was believed to be the work of a respected elderly man, Kalong Omthaisong. 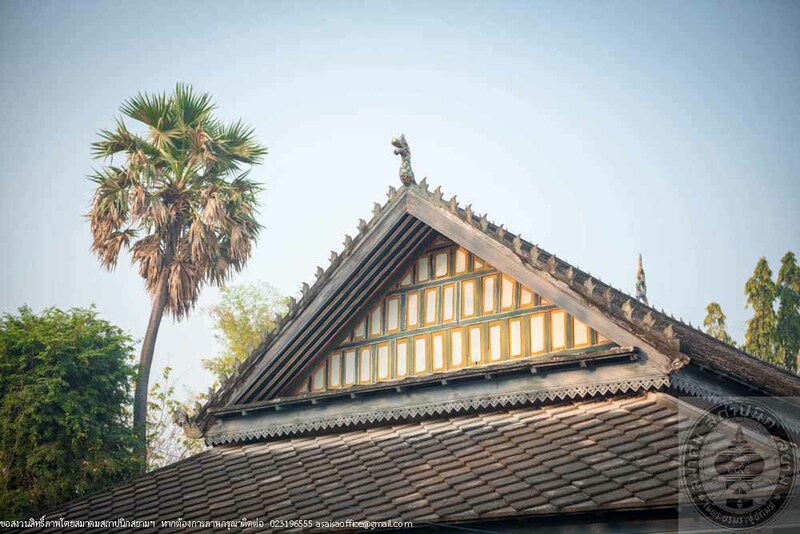 A gable roof with extended eaves covering all four sides of the building thatched with diamond-shaped tiles and decorated with roof ornaments including Chofa and Bai Raka. The height of the building from the level of the floor area around the building to the level of ridgepole measured approximately 7.63 meters. 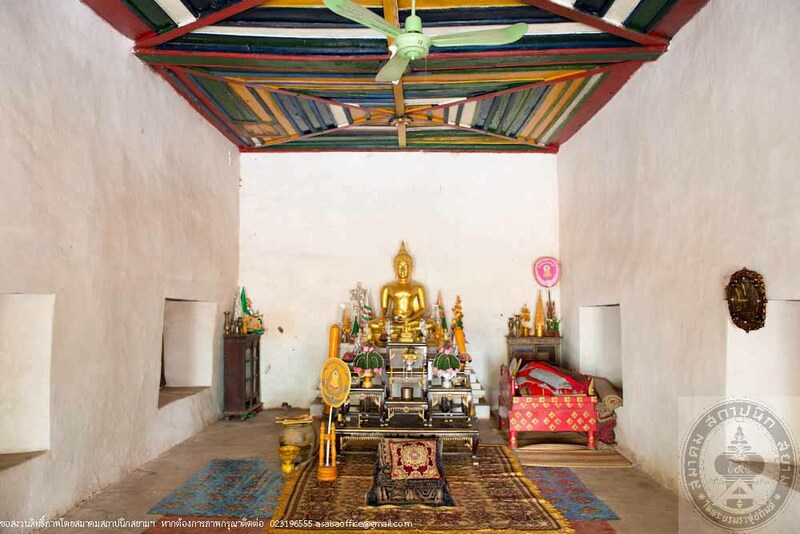 The interior is an open space with cement floor with a plaster base of a Buddha statue. The building today remained in its original condition except for the faded mural paints on the outside of the building. To preserve murals, the Department of Fine Arts applied chemical coating over the paintings. Ancestors of many of the elders in this village were involved in the construction of this sim. They helped in the kneading of raw clay and baking them into bricks, producing roof tiles, finding Erythrophleum wood in the forest and transporting sand from the Moon River to be used in the construction of the building. 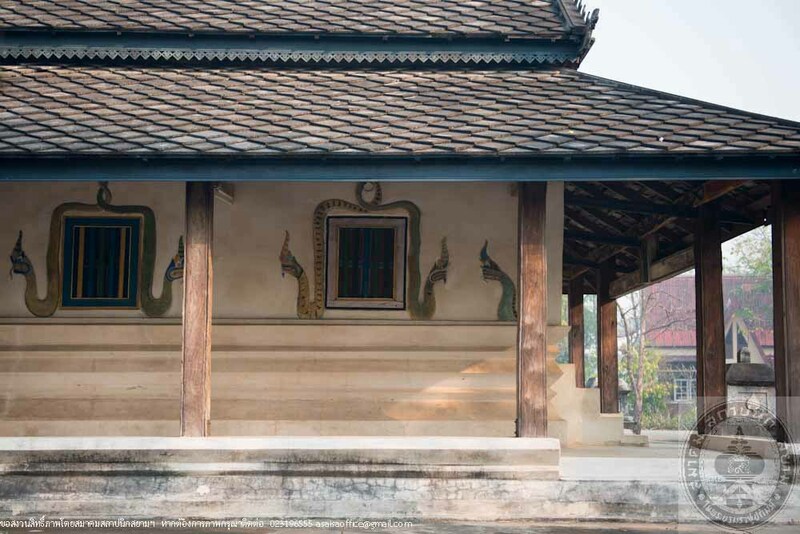 They worked together with a Kula native artist who painted the mural on the back exterior wall depicting the story of Pra Malai, Lord Buddha’s apostle, who traveled to Hell and Heaven. 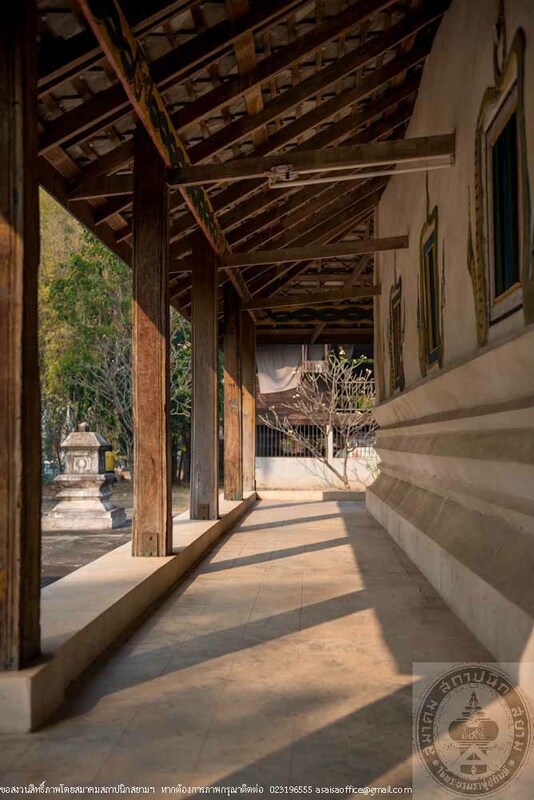 It took faith and harmonies of the people in the community to complete the construction and to promote virtue and morality within the community, Wat Borommakhongkha’s sim has been regarded as a historical monument that reflects the mutuality, the local tradition and the way of life of the people of Baan Wang towards Buddhism that is still continued. 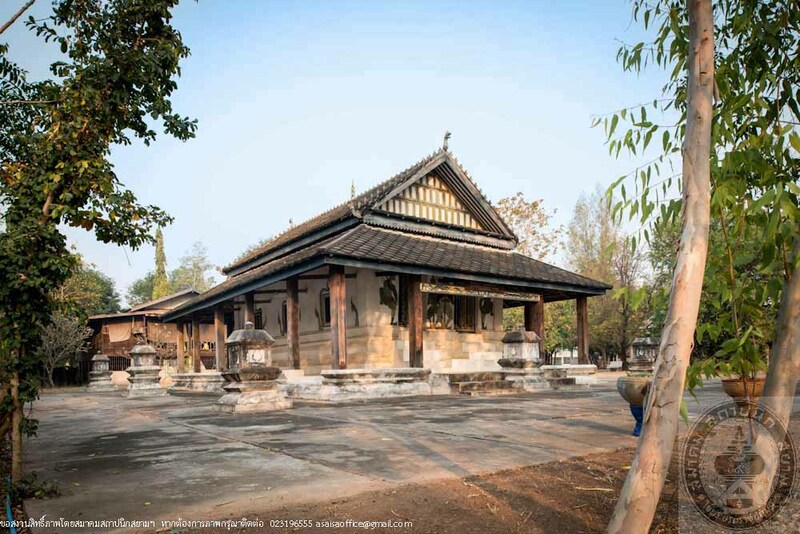 Wat Borommakhongkha’s sim, therefore, possess the community’s historical and spiritual values. The building shape that was beautifully proportioned indicating the architectural craftsmanship and engineering while the mural decoration showcasing the aesthetic quality of folk arts making it an excellent example in the study of architecture.